I am currently gazing out my home office window at a very dim and dismal view; rain running down the window, slate grey skies, a partially flooded driveway and trees swaying in what I know is a particularly arctic wind. A few weeks ago there were positive signs that Spring was on its way – tulips poking out of my windowbox, bouts of warm sunshine, daffodils, the smell of cut grass…. and then something changed. Somehow we seemed to regress back to the depths of winter. The flood plains across the road that had started to dry out are now filling with water again and my morning dog walks have dropped back into minus temperatures. I actually feel like this morning though as I know a lot of you have snow! Sound the klaxon, I need some emergency shoegazing, and I need it fast. And I need some bright colours to get me out of this funk. 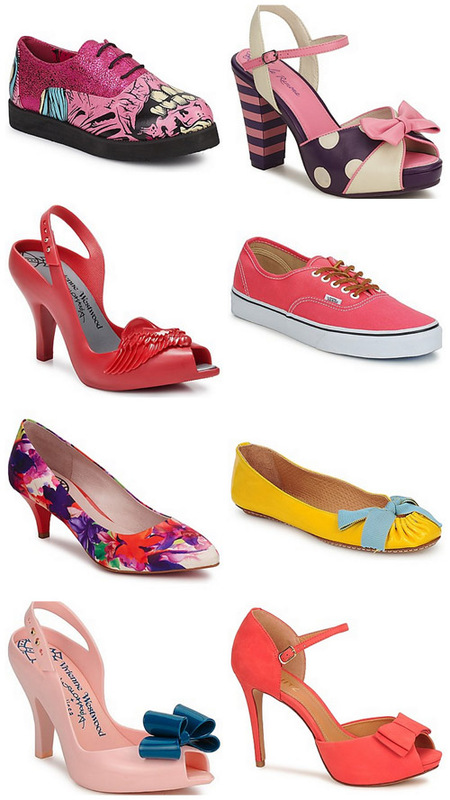 Enter, my ‘cheer up shoes wishlist’…. 1. grave dancer creeper, iron fist, £46.99 – okay, so I know these are well into the ‘ugly shoes’ category and that pink glitter creepers with a zombie face emblazoned on them may not a match made in heaven make… but there is just something about them! 3. lady dragon westwoods, melissa, £119 – I have been dreaming of these swoon-worthy shoes for quite some time, the only thing that stops me biting the bullet is the fear that they’d be crazy uncomfy – anyone know? 4. authentic pink, vans shoes, £65.99 – I’m having a bit of a coral/pink moment at the moment and I love the brown laces and bright colour of these classic Vans. 5. mylady shoe, fornarina, £110 – I have a feeling these would be perfect with turned up jeans and a vest when the warm weather finally arrives. Love how colourful and dreamy they are! 6. ballerinas, maloles, £154 – although quite pricey for ballerinas I just can’t get these out of my head. Would never usually put yellow and baby blue together but these just look so perfect! 7. lady dragon westwoods, melissa, £138 – okay, so maybe this list didn’t need two pairs of lady dragons but I can’t get enough of the pastel pink and that big bow, I love! Are you eyeing up summer-y shoes or are you firmly sticking with winter wear for the moment?